Zoey Clark threw herself firmly into the mix for a world championship debut this summer by rocketing to the top of the British 400 metres rankings in Geneva. 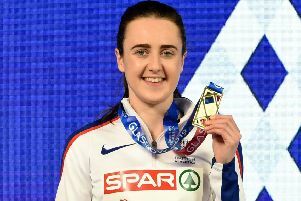 The 22-year-old Aberdonian slashed almost three-quarters of a second off her personal best to take victory at the Caillet Memorial meeting in 51.84 secs, inside the qualifying mark for London 2017, with fellow Scot Kirsten McAslan winning the B race in 52.90. Jade MacLaren set a lifetime best of 2:06.37 to take second in the 800m, one spot ahead of Emily Dudgeon. But Jack Lawrie missed out on his chase for a qualifying mark for the European Under-23 Championships after fading to sixth in the 400m hurdles. Sarah Inglis will chase the Commonwealth Games 5,000m qualifying standard in Portland today. Scottish prospect Josh Kerr underlined his huge potential by taking the American collegiate 1,500m title in Oregon. The 19-year-old from Edinburgh, competing for the University of New Mexico, held his nerve on the final lap to win in 3:43.03 with fellow Scot Neil Gourley fifth. And it completed a double for the European junior champion who landed the indoor crown in March.